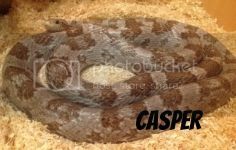 When you first get your snake you can find it very confusing about what size �meal� to feed it and how often, unless you�ve been given GOOD advice from where you got it. Even then you have the situation of when do you increase the size of the food, etc. Don�t worry�.everyone experiences the same thing! Once you first collect your snake it is best to leave it for a week to get over the stress of being moved and allow it to get used to its new surroundings. This means no handling and will probably mean that it misses a feed. Don�t worry about this, corns can go a long time without eating, even hatchlings. Personally, once the week is over I would feed it, leave it for the required 48hrs to digest its meal and then you can begin to handle it. I know it means putting off what you are desperate to do, but what is most important is that your snake is settled and eating. Hopefully you will have been told by whoever you got your snake from what it is eating and how often, or you may have been given records of the snake�s history. A lot of us keep records as they can be helpful indicators to there being a problem and also purely out of interest. 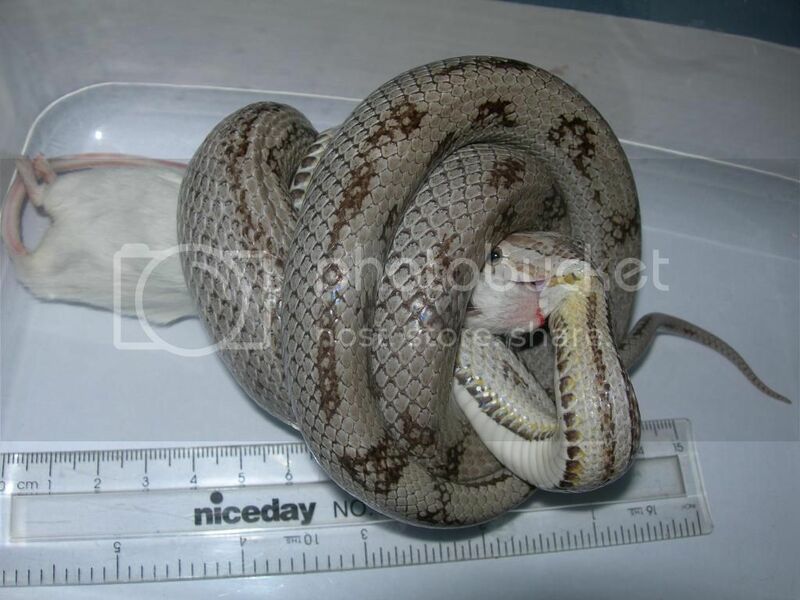 2 things to record are your snake�s weight before a feed and what it is being fed each time. You can weigh your snake by putting a small tub (or whatever size container is necessary) on digital scales, zeroing them and then adding your snake. This is a VERY ROUGH guide you can use to give you a basic idea of what size food your snake should be on. 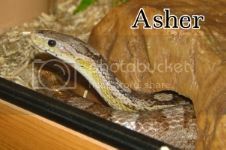 I found it very helpful when I started out, but I know people whose snakes should supposedly be on a certain size because of their weight but aren�t big enough for them yet. One of my own snakes is an example. According to the guide she should be on X-large mice but they would be double her width. She has just moved up to mediums and probably won�t ever progress further. This is because of being badly cared for as a hatchling and, therefore, not thriving and growing as she should. You should only use this guide in conjunction with common sense and knowledge of your snake; it should not be followed religiously. It really is a case of doing the research, trusting your own instinct, trying something and seeing what works. Be aware that depending on where you are in the country or what suppliers you use, they may call the mice by other names, or put different weights in different categories to what's listed above. It's not important, just something to be aware of. If you are feeding 2 pinkies/fuzzies/fluffs, then wait until the 1st has moved to approximately one-third of the way down the snake�s body before you offer it the 2nd pinkie/fuzzy/fluff. There should be no reason for you to offer more than 2, after that move up to the next size. You can work out if your snake needs to move up in size, or whether to feed double, when there is no longer a bump once they have eaten their 'meal'. NEVER give a snake a �meal� that is more than 1.5 times wider than the widest part of their body. It is amazing the size of �meal� they can eat, but something that big would be too much. Remember that snakes are opportunistic feeders, in the wild they will never know when or where they are getting their next meal and they are the same in captivity, so given the chance they will overfeed and it is up to us to make sure this doesn�t happen, no matter how hungry they may look. One of my snakes was being fed 3 -4 medium mice, once a week! He definitely didn�t need that amount but would eat them because they were left in his viv. He is NOT eating that any more! Often the question comes up about feeding snakes rats instead of mice. Rats are thought to be more nutritious and have more calcium due to more solid bone structure than mice, but they are high in fat. Rats can be fed but should be fed less often than mice, and the problem is that your snake can take a liking to rats and not want to go back to mice. Rat pups do not have the equivalent nutrient level as adult mice, they can�t as they are not on solid food. They are fatter though and quite a bit bigger than mouse pinkies. They actually have more goodness in them than mouse fuzzies (the only difference between mouse pinkies and fuzzies being that one has hair and a slightly more advanced bone structure). A young snake won�t get fat from them unless you start feeding every 3 or 4 days, constantly loading it. With adults, as long as you feed them every 10 days it should not be a problem, but if you feed them more regularly than that then you are going to have a fat snake. I know some snake owners do feed their corns rats, but most tend to feed extra large/jumbo/ex-breeder mice (35g plus) every 10 days to 2 weeks. This is really just a maintenance diet as they are no longer growing and needing to put on weight. The subject of feeding snakes chicks does sometimes arise. These do not have enough nutrition to be used as a staple diet for snakes but have been used either as a treat (although you then may have the problem of your snake not wanting to go back to mice) or for if your snake is not feeding�.then you can try scenting with a chick and may eventually try feeding them if nothing else is successful. You can either feed your snake in their faun/RUB/viv or you can feed them in a separate container. A lot of owners do feed their snake inside their home and the only issue is a worry that the snake will swallow some substrate as it eats. This can be combated by putting a piece of paper, kitchen roll, a tile or plate inside and then dangling their �meal� over that or laying it on it. You do still run the risk of the snake dragging the �meal� off and onto substrate, but most often this doesn�t cause any issues. The other option is to feed your snake in a different container. For a hatchling you would start with a small tub and then move up in size as the snake grows bigger, until you can get them to a point where they will feed on a towel on the floor. To begin with you may need to put a lid with air-holes on the tub and cover it, as your snake may be a shy eater. You may also need to leave the �meal� in the tub with it for a while before it feels happy enough to eat. But slowly it should gain in confidence and you can remove the cover, then remove the lid and watch your snake eat. Feeding them outside of their home definitely gives you a better opportunity of great feeding pics! Once your snake has eaten you can either lift the tub up to their faun/RUB/viv and allow the snake to slither back in by itself, or you can very gently lift it up, being careful to support the �bump�, and place it in its home. The 1st rule is not to panic. Snakes can go a long time without food. Juveniles and adults often go 3 � 4 months without eating because it is the breeding season. 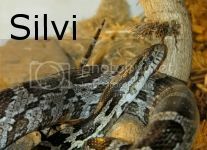 Not only will your snake be refusing its �meal� but it will be showing very different behaviour inside its viv. Instead of hiding away it will be out and about all the time, cruising around, trying to escape by pushing its way out of the vents and rubbing its nose against the glass doors. As far as feeding during this period is concerned continue with your normal routine, offering them the mouse on feeding day and then throwing it away until they decide to eat. I have found that dropping down a mouse size can keep a snake eating, at least occasionally, during this period. 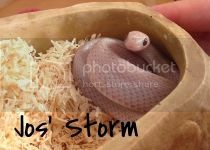 There are other reasons for snakes not eating and if yours isn�t you need to check things like the temp of the viv, whether it is drinking and pooing ok, whether there has been anything that may have stressed it recently, whether its due a shed, etc. No handling of your snake for 48hrs after it has been fed. Once you know your snake you may be able to change this as some snakes metabolise their food quicker than others, so could be handled after 24hrs but I have always stuck to the 48hrs golden rule as I don�t want to risk disturbing their digestion and causing stress....just so I can have a handle! Excellent guide, Kellog, and should be stickied, I think. I'd also add: it's ok to feed 2 x pinkies, but when your snake is, let's say, on small mice, and needs to move up size ( smalls aren't leaving a bump, and weight wise he should be on bigger ) - but still really struggles to swallow smalls - don't feed 2 x small, as that gives the snake way too much food. I fed small and pinkie, or small and fuzzy. Another confusing thing could be the mouse size. Some suppliers do not provide hoppers, others class their mice as small ( 12 -14 g ), medium ( 15 - 20g ), large ( 20 - 25g), extra large ( 25 - 30 g ), jumbo ( 30 g + ). It's best to go on the weight of the mouse ( and the width, obviously ), I found. I'm also keeping my mind open on the " chick feeding " scenario. There's a " nutrition content " table comparing the levels of nutrition of mice, rats and day old chicks on RFUK ( dark side ) . It shows the levels of protein, calcium, etc in various sizes of mice, rats and DOC - and the chicks don't come out as bad, as generally thought. Another question I've seen popping up is that of supplements. The general feeling is, that the mice contain everything the snake needs, and supplements aren't necessary. Some breeders do add calcium ( and vit D ) during breeding season, to breeding females, some don't. I must admit, I add reptile vitamin and mineral + calcium supplement to roughly every 6th or 8th feed ( I vary this a lot ). I'm doing this, as I feel that in nature, the snakes would also get the various stomach contents of the mouse, which, too, might ad to their diet. As I can't be sure, what the mice I'm feeding mine, have been fed on ( or, to be honest, even where they come from ) - so I can't see any harm in supplementing - as long as it's not overdone, and not done at every meal. Hope you don't mind me adding this :-). Thanks Razee, I really appreciate the comments. No surprise about the typo, I did it at about 4am this morning after battling to update my sigs! Hopefully those lovely Admins will change it for me . Agreed about the confusion over mouse size, it's why it's so necessary to put in weight....but the best I could do. Have never dealt with supplements myself, so will be interested to see what comments come up regarding them. Thanks again, was nervous about doing it but your comment has made it worthwhile . Re supplements - I don't know, if anyone's seen the `SnakeBytes TV episode about the corn snake feeding experiment. He fed ( now, I don't know if I get this right ) 1 group of hatchlings often, but small prey, another group less often, but large prey, and another group got vitamins with the food. The group fed the large prey grew most, but hat was interesting, was, that the group fed vitamins also grew larger than he expected. I must try and find it again ( I'mpoopat linking, though, and on hubby's Mac . ). Found it, it's from 7 -8th Sept 2001, and is called Satan Snake vs Chewy. It comes out first, when you type in Snake Bytes Tv corn snake feeding experiment, the interesting bit starting at roughly 2 mins into the program. He had 4 groups: first fed 2 x week, but smaller prey, second once a week, normal size prey, third - once a week, normal size prey + vitamins, fourth - once a week, large prey. First group grew very little, second grew bigger, third, with the vitamins, 10 - 15% bigger than the same group, but without; fourth was huge! Very good, but maybe one of the lines could be altered a little? Corn snakes can manage something 1.5 times their width. "NEVER give a snake a �meal� that is 1.5 times wider than the widest part of their body." Perhaps this should be "more than 1.5 times wider..."
This is a very good guide. The nutrition guide is a really good read as well! I use something similar, but I only feed up to medium mice. 4-15g - 1 x Pinkie Mouse (1-3g) Every 5 days. 16-23g - 2 x Pinkie Mice (2 x 1-3g) Every 5 days. 24-40g - 1 x Fuzzie Mouse (4-6g) Every 5 days. 41-70g - 1 x Large Fuzzie Mouse/2 x Fuzzie Mice (10-12g/2 x 4-6g) Every 7 days. 71-130g - 1 x Small Adult Mouse (12-14g) Every 7 days. Once they are over 400g, I feed a day old chick in place of a medium every 3 feeds. As for what size mouse a corn can eat, you would be surprised at what the can manage. Sirae eating a 36gram mouse. She weighs 197grams in this pic. Other than an extra day digesting, there were no problems. But they are about the same size as jumbo mice, so I feed them every third feed to 400gram+ snakes. Very useful! Good post! Can we sticky mods??? I'm deffo saving! Obv it's not same in every scenario and u have to judge but great if your newbie snake owner/ unsure or basically wanting to refresh knowledge! Thanks for all your comments, I do appreciate them. This began as notes I made for my own benefit as I was learning about corns, so most of it has come from others on the forum , but when I realised how helpful I found it having the info in one place and seeing the amount of times people ask questions about feeding I decided to post it. There are the obvious typos and bits I forgot....which I'm hoping the Mods might correct if they decide this is worth stickying . I've certainly been glad of the extra info that has come about from it, like the use of vitamins, and hopefully others will add their thoughts on the subject as well. Obviously it is all down to the owner using common sense and a knowledge of their snake, as I said....but if this post can help guide people in the right direction then I'll have achieved what I set out to achieve . Hi we have recently acquired a lovely corn snake ,Diego. Judging by the thread on obese snakes he does look like he could be a fatty! He is having 1 large mouse a week, do you think this is too much? Yesterday when we fed him he took some time getting it down, should he go on a medium mouse once a week? Any advice gratefully received. Thanks for this sticky, very useful. From it I think that my snake may have been a little less regularly fed than maybe others would as a young snake. She has been out and about in the evenings now and seems to be settling in so I may offer her, her first feed tomorrow as i want to start fattening her up a bit! According to the reptile shop she has been being drop fed pinkies. I want to minimize the stress to help her eat, I have her in her tank on aspen bedding. Would people recommend that I place paper towel in there and place the pink on top and leave her to it or remover her and place her in a separate container to feed? Don't want to stress her by moving her to feed but i don't want an impacted snake either! If I do place it in the main faunarium, does she need to be out and about when I do or will She smell it and come out if i just leave it there for her. Also whats the best way to defrost the pinkie? Thanks for any help as always! I'm glad you found this useful Redware . Unfortunately it isn't surprising that your snake may not have been fed enough....often shops will only keep their snakes on a maintenance diet, rather than feeding them enough to grow . If you've had her less than a week, I'd leave her for the full week without feeding or handling her to let her get over the stress of the move and get used to her new environment. Personally I'd then feed her, leave her for 48hrs and finally handle her. As for feeding her inside or outside her tank, you can do either. It is probably a good idea to do the first few feeds in her tank, as that's what she's used to. Once you've got her feeding regularly you can try feeding her in a separate RUB if you want to. There are definite advantages to feeding her out of her tank....less worry about her ingesting any substrate and a better chance to get pics . But there's no rush. Put down some kitchen roll or paper, with the pinkie on it. She'll smell it and come out to eat it. It may be worth covering the tank for the first few feeds, so she has some privacy. Don't expect her to respond immediately....she's going to be wary to begin with. It's probably a good idea to keep a record of her weight, and the best time to weigh her is before you feed her....because its a regular time and it also means she is probably 'empty', with no poo adding to her weight . You can put a small box or a bowl on digital scales, zero them and then add your snake. That way you'll get her weight. As for defrosting a pinkie, they usually defrost at room temperature in about an hour. Don't try microwaving them....they burst ! If you want you can warm it slightly, to make it more attractive to her. Put it in a plastic bag and dip it in lukewarm water, or heat it with a hair dryer. I'm assuming from that I shouldn't worry to much about weighing her the first couple of feeds then as that will need me to put her into a rub/ cricket tub? As soon as she is settled and feeding I will start weighing her though. I'm a chemistry teacher so electric scales won't be an issue! I will give it a couple more days before a feed as I got her Saturday. She has come on in confidence each day she did a couple of laps of her faun with us in the room last night. p.s. 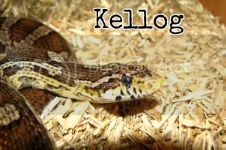 The schools snake is also called Kellog and I'm on a welfare mission for it from what I have found out here on the forums! That's absolutely fine to wait a few feeds before you weigh her Redware....should have thought to say that . And the timing you've decided on for her first feed sounds about right. I'm really pleased to hear that she seems to be settling in and making her presence known . Unfortunately the situation with your school's Kellog is no surprise ....I'm just glad that you are on a mission to improve his life . Let us know if you need any advice on how to help him. Woot, Willow has eaten... At least I assume she has. We left a pinky on a paper towel when we went out and it is now gone! No sign of willow but either she has eaten it or hidden it in the hide with her. Thanks for the advise. That's great to hear Ben ....and a relief for you, I know. No need for the thanks, it's what we're here for .